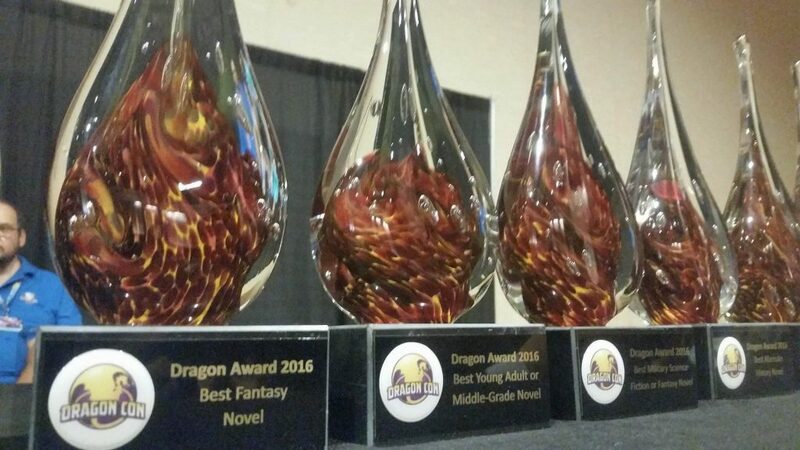 The 2018 Dragon Awards Ballot was released August 6. A notable change is that most categories have six nominees (a few have seven, or five) in contrast to last year when they had seven or eight. Also noteworthy is that no 2018 Best Novel Hugo finalist appears on the Dragon Awards ballot — but whether the explanation is that the authors declined, or the works didn’t receive enough votes, is unknown. Voting registration closes on 8/31/18. Voting closes on 9/1/18. This entry was posted in Awards and tagged Dragon Awards by Mike Glyer. Bookmark the permalink. * Photosynthesis is a game about sunlight and trees growing (not “growing trees”, just trees growing). Completely scientifically mundane. * When I Dream is a 2016 release. Admittedly, it got new cover art in the eligibility period, but that suggests an interesting case for future nominations. ** As Wikipedia lists the earliest azulejos in the 13th century, it’s even potentially historical here in 1265. One incredibly popular book, one pretty popular book, one kinda popular book, and three books that aren’t popular at all. Weird, huh. Well, I’ll give them this: Meddling Kids was one of my favorite recent reads. I’m kind of amazed, however, that Before the Storm garnered enough votes to get onto the final ballot since it came out two months ago and is a piece of media tie-in fiction. Comics section: Both Doomsday Clock and Mister Miracle are limited series that aren’t finished yet, making them a bit difficult to evaluate. Also in the Graphic Novel section, are the Dragons intending to refer to White Sand Vol. 2 which came out in February? Because Vol. 1 was released back in June 2016. Meanwhile, The Vision is listed here under Graphic Novel. I think there’s merit to dividing a graphic stories category based on ongoing vs limited or even collected vs original trade, but this just seems arbitrary. I’m confused to see the board games listed as being “by” their publishers and not by their designers and artists. If the creative talent behind books gets credited, so should the creative talent behind games. Comics as usual, are a mess. Horror looks relatively OK. Glad to see Paul Tremblay nominated though I haven’t read the book yet. Communications Failure was one of my favorite books, so glad to see that. What’s the difference between the Comic Book and Graphic Novel categories? I don’t see a ton of Puppies on the list. A few here and there, but … did the Puppies not try this year? Did they feel like they made their point last year? Those last two categories, though? Ugh. It’d be nice of they credited designers instead of publishers for the games categories. But there are also a bunch of supplements and expansions (and not standalone expansions) on the list. Rising Sun is fantastic. A great game. Good nominee, and a great choice. When I Dream is the only game on the list that I worked on. But it’s not by Asmodee. It’s published by Repos Production, and is distributed by Asmodee in the US. Also: It was released in 2016. I’m not sure it’s eligible. Mysterium: Secrets and Lies Expansion isn’t a game. It’s an expansion and won’t stand alone. Also: Its publisher is Libellud and Asmodee distributes. Azul isn’t SF/F. It’s an abstract with a thin coat of flavor paint to put it in medieval Spain. Good game, though. Red Dragon Inn 6: Villains is light and fun. It’s an expansion, but it’s a standalone expansion (it includes everything you need to play, including rules and tokens). Photosythesis is not even a little SF/F, either. It’s a luck-free brain-burner, and I do like it, though. What a mess of a category. That is such a nonsense grouping of games. Warhammer 40,000 8th Edition – A huge improvement over 7th. Force and Destiny Role-playing Game: Knights of Fate is a supplement, not a standalone game. Cooking with Dice: The Acid Test is the only thing on the list I hadn’t seen before. It looks cute. D100 Dungeon is more board game than RPG (it’s even posted on BoardGameGeek.com and not RPGGeek.com). It’s also the only item on the list which credits the designer – probably because it’s self-published. Magic: the Gathering: Unstable is another expansion that cannot stand alone. Neither did any Sidewise Award novel finalist. Still crunching numbers but it looks like there are almost zero Rabid Puppy nominees. They always had some non-genre boardgame niminees, but this year its ridiculous. I mean, good games mostly, but only one genre boardgame and an expansion. When I dream was originally published 2016 by the original publishers, but then got picked up last year by Repos and made widely available in a new (bigger) edition. I think thats OK as a nomination (wouldnt possible at the Hugos of course, but its eligible for most boardgame awards as well). Its not a SF or Fantasy game by any stretch though. Long time no see, all! I haven’t heard of four of the sf novel nominees, so I looked them up — and what I found cracked me up in a big way, whether it should have or not. First, It Takes Death to Reach a Star. Turns out this is a dystopian story, with the tagline “THE WORLD YOU KNOW IS DEAD. WE DID THIS TO OURSELVES.” This makes me laugh because one of the major complaints I’ve heard from the puppy types is that Hugo fans nominate depressing books about humanity’s failures, while we should be nominating more optimistic tales. Poor pups, they just can’t escape dystopia even in what they’d like to see as their own awards! OTOH, the backgrounds of both authors look interesting (one is a SWAT officer, the other is a PhD endocrinologist), so I may have to check it out. Second, The Mutineer’s Daughter. This sounds more typical mil-SF, except that Terra is the bad guy. Oops! Again, both authors have interesting backgrounds (both are Navy vets), so I may have to check it out. I do like to try out mil-SF written by guys who actually have some clue about the military. Third, Win. Oo icky girl cooties! I don’t know what this one is doing in the SF novel category — it’s YA, and its blurb makes it sound like it’s perilously close to both fantasy and romance. Ewwwwww, go the pups. I suppose this is like the Dragon Horror category in Year 1 going to a work of UF — the categories don’t really mean much! And fourth, Sins of Her Father. Finally, a nutty nugget mil-SF for the pups to drool over, and published by Baen to boot! But again with the girl cooties — ewwwwww, go the pups again. Mike Kupari is also actually from the military, so I might check it out. I haven’t even looked up the fantasy novels yet — again, I’ve never heard of most of them. Can I hope to be laughing even more once I do? Many congratulations to all the nominees! I hope to see you at DragonCon in a few weeks. P.S. — Oh! I just looked up the first fantasy nominee, Shoot the Messenger. Now I’m REALLY cracking up. Hampus: ‘Comic Book’, weirdly enough, actually means a comic magazine, the floppy version which appears weekly, while ‘Graphic Novel’ means a comic book. They do seem to be coming from a different place than the Hugo finalists. I would be interested in knowing more about the nomination process. I’d also be interested in knowing more about many of the prose fiction finalists that are unfamiliar to me. I find it interesting that I know one writer in every catagory at least and not because of negative conections. A few works I could see on the longlist for the Hugos. But I have to confess that a lot of works and writers are unknowns for me. For example what is the 3rd popular book in the SFGroup? Win by Nazarian has 1300 ratings on GR, so I’m assuming that’s the one intended. The others (non-Artemis, non-Persepolis) have less than 100 each. Yes I was using Goodreads as a measure of popularity. Contrarius, I’m glad things are looking up for you. And P.S., I’ll be rooting for Marko Kloos in Mil-SF. He was a class act during the puppy shenanigans, and his book has three times as many ratings (3,000-something) as the next most popular book in the category (Weber et al). My sympathies. I’ve got a similar problem with a sick (and cranky) parent, so I know what a chore it can be. Regarding the Dragon finalists, like I said over at Camestros’ blog, it seems like the Dragons have been taken over by various Kindle Unlimited writing factories such as Chris Kennedy’s puppy-adjacent outfit, Michael Anderle/Craig Martelle, the LitRPG and the reverse harem titles in the fantasy category, etc… These titles are very visible at Amazon due to high ranks via a combination of a voracious readership in Kindle Unlimited and a high ad budget, but often not all that well known outside the Amazon/Kindle Unlimited bubble. But then, as much as the puppies extoll the virtues of indie publishing, the various high volume indie writers and writing factories have been eating their (and every other indie writer’s) lunch for years now. So the Dragon Awards ballot now resembles the Amazon bestseller list in the various subcategories rather than the various overlapping puppy slates. I guess that’s progress. Oathbringer , from a Hugo-shortlisted series. Saga, series including a Graphic Story finalist. Monstress vol. 2, Graphic Story finalist. Paper Girls, from the same series as a Graphic Story finalist – different volume, though. Star Trek: Discovery, has a Hugo-shortlisted episode. Thor: Ragnorok (or Ragnarok), DP Long Form finalist. Blade Runner 2049, DP Long Form finalist. How on earth is Planescape: Torment on the list? Sure, the mobile port is new but the game is from 1999. That’s really interesting. I had no idea! I’m surprised to see Aleron Kong as a nominee. He’s very popular with the litrpg crowd (well, the ones who don’t hate him for the trademark idiocy) but this is the first I’ve seen of him being lauded in “normal” fandom. I’m also surprised it was Predators that earned a nomination, though of course it was his only release last year. It was a good yarn, but not his best in my opinion. Do they take volume into account? It was 2200 pages long. @Andrew Children of Blood and Bone is amazing and will be making my Hugo Ballot for next year. It’s been a major seller. Came out this year. Warcross by Marie Lu is also really good and is from a #! NYT bestselling author. Not familiar with the Kontis or the Donne. Alethea Kontis is a Dragon Con regular – does a thing called “Princess Alethea’s Traveling Sideshow”. I think she was also a finalist in a previous year, so it would make sense for her to be nominated by Dragon Con people. Looks like Jim Butcher has also promoted her in the past. I’m trying to check some of the less-known people with some of the Dragon Con regulars. Saga and Papergirls are two very popular and highly acclaimed comics (sharing Brian K. Vaughn as an author). Saga has won multiple Eisners, and it is no surprise to see it nominated. Marjorie Liu just won an Eisner for best writer. Papergirls was Eisner’s best new comic in 2016. But some of the others here are really not in the same league – the Typewriter has 8 reviews on Goodreads; The VIsion was published in 2016, as far as I can tell. Looks like the Watchmen sequel had a big hang-up in production. It’s also weird that in contrast with other categories, some of Dragon Con’s most popular guests (Babs Tarr, Kelly Sue DeConnick, Matt Fraction, Paul Jenkins, Jimmy Palmiotti and Amanda Conner) are not nominated. It’s not as if they haven’t been doing stuff. I can’t imagine that the people who voted for these comics are largely the same people who go to the Dragon Con comics track. One more thing on comics. I imagine some pups and friends are upset that the Mighty Thor would get nominated. Unless I’m mistaken this is the “SJW” Thor that’s been the target of much wrath. Googled a couple of the Best Science Fiction Novel titles. They don’t seem to be the kind of thing that would interest me. @Goobergunch The Hartley is a self-pub, and according to Amazon, is from earlier this year. Warcross was late last year., as was the Kontis. The Donne is also from this year. Thanks @Red Sonja- that would make sense. I know who she is, but not read anything. I will say that Nazarian on the ballot is ugh, but whatever. Graphic novels have a spine. So does this mean Astro City is evolving? I think the admins may have done some shuffling of nominees between categories – which is a sensible move given how overlapping the categories are. Hey guys, so this is one of the authors of It Takes Death to Reach a Star (Gareth Worthington). I will fully admit I have no idea how we made the list! Though I’m not going to complain. Stu and I are new to the scene, but perhaps some of the activity around our book played a part? ITDTRAS had its rights acquired by Boilermaker Entertainment (founded by the director producers of the CSI franchise) for tv/film; won the 2018 NYC Book Festival Sci fi cat; and has been short-listed for a Cygnus. It’s also on the reading list for a Nebula. Whatever the reason, we are very happy just to be there. For as long as that’s in doubt, the quality of the awards and the deserving-ness of the nominated authors is always going to be uncertain. And that’s a real shame for works that have found themselves on this ballot honestly, and deserve to be recognised and celebrated. Basically: the Dragon Awards are letting their own nominees down. Congrats on your nomination, Gareth. Looks like you have an enthusiastic fanbase there. ITDTRAS had its rights acquired by Boilermaker Entertainment (founded by the director producers of the CSI franchise) for tv/film; won the 2018 NYC Book Festival Sci fi cat; and has been short-listed for a Cygnus. It’s also on the reading list for a Nebula. Cooel. I bet you’ve been thrilled about its success so far! I presume that you’re aware that these are what is called “pay-for-play awards”, and that the New York Book Festival has been reported on the Writer Beware website; they’re maybe not something you want to publicize, because they detract from, rather than adding to, credibility. And the way that a book gets onto the Nebula reading list is that one of several thousand SFWA members puts it there; it’s not a juried list or any measure of quality, it’s just a list of books recommended by individuals. However, I congratulate you on the TV/film option, and wish you the best on it getting developed into a movie or series.